slip ring Induction motor is made up of 3-phase and double-layered distributed winding that consists of coils used in alternators. The rotor has in its core, steel laminations that consists slots to accommodate three single-phase windings. Slip ring induction motor has the advantage of having high starting torque compared to squirrel cage motor. They are usually employed where load requires good speed control or high starting torque. Slip ring induction motor application prevails in printing presses, large ventilating fans, loads requiring speed control such as for driving lifts and pumps, hoists, elevators, and, compressors. 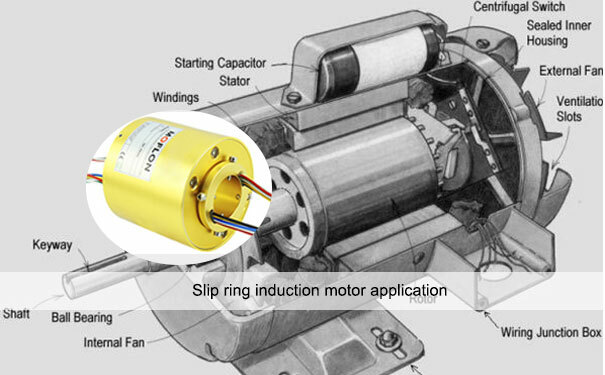 A slip ring induction motor is easy to start. By putting resistance in series with the rotor windings, the starting current can be kept low while maintaining good starting torque. As the motor speeds up, the resistance is reduced until at full speed, it is shorted to zero. It may also be speed controlled, by recovering the slip power in the rotor through the slip rings and feeding it back to the supply. Slip ring system enables the use of external variable resistances during the starting to limit the starting current. A slip ring has two main components – a metal ring and a brush contact and the number of rings and brushes found in a slip ring assembly are liable to change depending on the needs of the device. UEA brush contacts are made of sintered metal copper graphite or silver graphite and rub against the outside of the rotating metal ring. Their work is to maintain a continuous electrical connection as one portion of the assembly rotates. 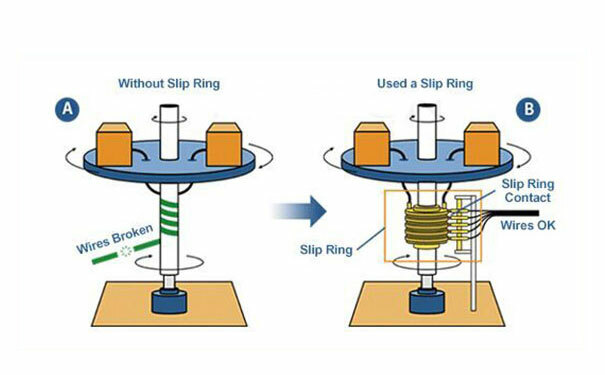 Still not clear with the mechanism behind how slip rings work? when both the brushes and arms rotate and it assures a complete contact at all times between the ring and brushes. The ring is made of electrically conductive metal, usually brass. It is usually mounted on, but insulated from a centre shaft. The insulating material between the rings and between the ring and the shaft is made of nylon or another non-conductive material. When the ring turns the brush conducts the electric current through to the ring which makes a connection. The wire leads from the brushes and rings are connected to electrical circuits. Slip ring can be used in an electromechanical system which requires continuous and unrestrained rotation while transmission of power. Where transmission of relatively low or high bandwidth analog and digital signals is required, slip rings perform really well. The speed of a slip ring induction motor can be controlled easily. Slip rings are continuous and the terms are not interchangeable. Slip ring consists of a stationary graphite brush which rubs on the outside diameter of a rotating metal ring. ?The slip ring technology has been used for decades as a method of passing current into a rotating device. Slip rings come in hundreds of sizes for almost any application, and can be made to custom specifications to ensure maximum performance. The transmission of power across a large free inner bore is of the key factors in a rotating system. what is the most importance for slip ring connectors?